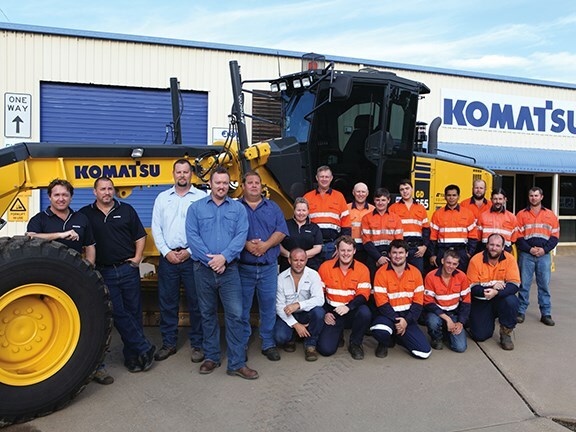 Komatsu Australia has moved to a 24/7 service and support operation for Central Queensland’s resources and construction industries by adding two resident technicians in Clermont and one in Barcaldine, and increasing capabilities at its Emerald branch. Darryl Anderson, the manager of the 10-year-old branch, says the expansion was driven by customer demand, an increasing machine population in the region, and a company philosophy of "having local people supporting local people". "With our increased technician base, we have gained experience which allows us to work on a variety of makes and models," Anderson says. "Our resident service technicians at Clermont and Barcaldine are complemented by increased capabilities at its Emerald branch – the primary service centre for the Bowen Basin mining industry." Among the expanded capabilities are the installation of a 100-tonne mobile track press and new hydraulic cylinder benches, which give Komatsu the ability to overhaul any size cylinder up to the largest mining equipment. The workshop capabilities have been expanded, and additional auto electricians have been brought in to increase maintenance and service capacity for all auto electrical faults as well as air conditioning repairs on earthmoving equipment.